VANCOUVER, Wa. – The Spotted Lanternfly is a small but mighty pest that is currently terrorizing several U.S. states. That was the message from an informative webinar on the insects today hosted by Instructional Technologies, a fleet consultant firm dedicated to safety and training. The antidote is truck drivers. Because the lanternfly isn’t a particularly good flyer, it travels mostly by hitching rides on trucks, trailers, and even cars. They lay eggs wherever they can, and the state’s Department of Agriculture is urging truck drivers to help stop the spread of these bugs. Right now, regardless of load type, if you have trucking operations or routes in Pennsylvania and New Jersey, where there are spotted lanternfly quarantines, new rules have been put in place requiring drivers and warehouse workers to take training in how to properly inspect vehicles and loads for infestations. Virginia also has a quarantined county, but has not yet mandated training. The lanternfly is known to eat crops, including fruit trees, hardwood, hops, and more. Some have even reported that the pests were responsible for 90% of crop losses. “The best way we can prevent the movement of the lanternfly is to provide education, to raise awareness of those who are living in the quarantine, and those that are doing business in and out of the quarantine,” said Rhodes. As of December 2018, in order to operate in the quarantined areas as a fleet, you must have a permit that outlines you have received adequate training. The process in getting a permit involves the fleet manager taking a 2+ hour course from Pennsylvania’s State Agricultural Extention and then from there he or she must order permits and train all his/her drivers and workers. For more information on the spotted lanternfly and how you can get training, click here. Here is a simple , very simple question for you . If the Lanternfly is a native from Asia ,what is Asia doing to prevent it from entering containers that are shipped from Asia to other parts of the world ? Obviously the Lanternfly didn’t fly from Asia to other parts of the world according to the statement in the article that states : ” the lanternfly isn’t a particularly good flyer” ………. And according to the statement in the article that states ; “The antidote is truck drivers ” ………………. And that the Lanternfly also hitches rides on automobiles(cars) , how can the truck driver be an antidote ??? I believe in order to understand this ” Lanternfly ” ,we should perhaps educate ourselves rather than believe some written up article stating that truck drivers are the antidote . Do you not believe that truck drivers have been unfortunately mislead enough , as well as the public ??? 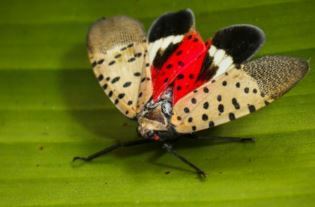 This article states : ” The spotted lanternfly is considered native to China, India, and Vietnam.” ………………….. My question remains the same about preventing these lanternflies from entering containers that are shipped around the world ? What are the ports around the world doing to prevent world widespread ??? Are they checking containers inside and out ? Are they washing off containers or decontaminating them ? Enough with the “truckers responsibility ” attempt . Go back to your drawing board ,take responsibility and find a real measure of prevention starting at the point of origin ! Find its weakness and discover a solution . You know what it likes to eat ,so you know how to attract it . Trap it and eliminate it ……. Ie: “food grade” diatomaceous earth is an amazing remedy for eliminating bed bugs etc. Do your due diligence . Perhaps it has a specific predator etc. If not , then create one ! Read this article . Quite interesting …………..
” Dr. Houping Liu, a state-employed entomologist, believes in science, not luck, but he confesses that his discovery of a potential weapon against the invading spotted lanternfly, was, well, a bit lucky. Enlisted into Pennsylvania’s fight against the invasive insects that have swarmed eastern Berks County and elsewhere in the region, Liu discovered wasps walking on a mass of spotted lanternfly eggs on a tree during a patrol of four residential properties near the border of District and Pike townships. And not just any wasps, but a species brought to Pennsylvania from Asia in 1908 to control the state’s population of gypsy moths, another invasive pest. Liu built a makeshift laboratory in an empty doctor’s office in nearby Boyertown, and brought a sample of the egg mass there, placing it in an incubator.